All other joints can be involved by ankylosing spondylitis, but joints close to the trunk are most frequently involved, these are the hip, shoulder and joints in the anterior chest wall. The changes are characterized by joint destruction with erosion accompanied by new bone formation at attachments of tendons and/or joint capsules (enthesopathy). Manifest changes in the shoulder and hip joints are often well visualised by conventional radiography. When radiography is normal, MRI may provide information about active inflammation as well as erosion and enthesopathy. 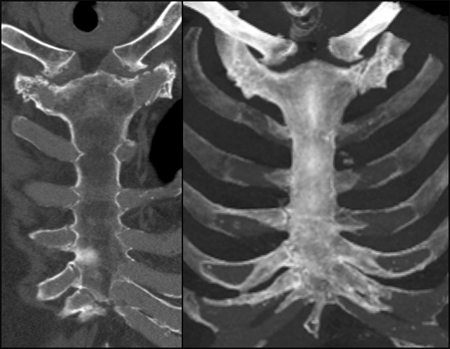 CT has a central role in detecting anterior chest wall changes which can be difficult to visualise by radiography. MRI of this region is often technically difficult to perform. The usual MR sequences take so long time that the patient needs to breathe during the image acquisition. This can cause motion blurring of the images. Ultrasonography is useful for detecting joint fluid accumulation and oedema in the soft tissue, but cannot visualise osseous changes. Scintigraphy may also be used for detecting active inflammation, especially if it is necessary to get an overview of the entire body. However, scintigraphy is rarely used today because it is associated with a certain amount of radiation and can only detect signs of activity (increased tracer uptake). It does not like MRI visualise disease abnormalities in detail. CT of the sternum and surrounding joints. 2D (left image) and 3D reconstructions show fusion of the joint between the upper and lower parts of the sternum. In addition, erosion corresponding to the joints between the sternum and the clavicle (sterno-clavicular joints) and exuberant mineralization of the costal cartilages.